Bali is the rock star of Indonesia’s 18,307 islands, and people from all walks of life are starting to whisper about this fabled place. With its tropical, semi-humid climate, and temperature varying from landscape to landscape, there is something for everyone in Bali. From trendy cafés to five-star restaurants to quiet coastal towns, this tourist hotspot has it all. Of course, there’s more to Bali than just wonderful nature, beautiful beaches, great surfing and tasty food. It friendly locals have maintained their traditional ceremonies and laidback way of life. Bali is like no other destination in the world. There is a spiritual energy surrounding the island that immediately relaxes you and improves your mood. Nicknamed “the Island of the Gods”, it has a history going back 2,000 years. You’ll find a rich mix of Chinese, Indian and European cultures. Southern Bali is split into districts and villages, and, as the island population has grown over the years, these independent districts and villages have merged into two very distinct geographical areas—southeast and southwest Bali. The southwest of the island is full of trendy cafés, restaurants and stylish shopping boutiques. The southeast is quieter, older and more exclusive. 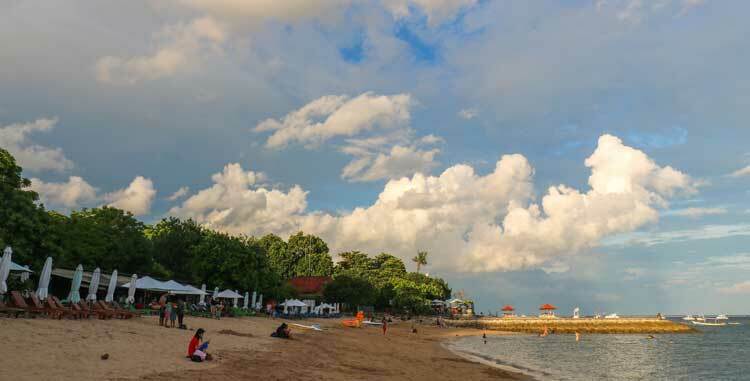 Bali’s capital, Denpasar, is farther east and inland while Bali’s oldest upscale resort area, Sanur, is a mature beachside town with good restaurants, quiet cafés and white-sand beaches. Inland, the town of Ubud, and the lush region surrounding it, is the cultural heart of Bali. The weather here is cooler, and you’ll find an international community of expats savouring the best of the island’s traditions, crafts and art. The north of the island is dry and volcanic. This area attracts adventurous expats, and has possibly the lowest cost of living in all of Bali. There are some great marine parks in the north and good diving sites where the main activity is dolphin-watching. The south of the island, by comparison, is lush and green, has good surf, and lots of smaller islands to explore just offshore. It is also where the majority of great restaurants and stylish cafés are located. The real Bali is to be found in its people, its glorious scenery, its traditional villages, the arts and crafts, the dance and the music, their architecture and of course, the food. In terms of its culture, I firmly believe Bali to be one of the richest and most beautiful places in the world. Where to Live in Bali: Beach or Inland…And Which is Best? Read more: Where to Live in Bali: Beach or Inland…And Which is Best? What Do Expats Do In Bali? Read more: What Do Expats Do In Bali? Another weekend is over here in Bali. Funny though, Monday doesn’t hold the same stigma it once did. Actually, most of the time I don’t even know what day it is! Just over two years ago, Mondays meant returning to a workplace I dreaded. Never-ending phone calls, meetings and working days that began at 6 a.m. and didn’t end until 7 p.m.